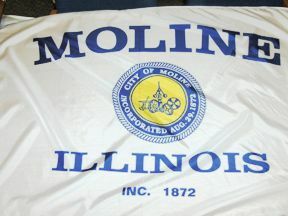 The flag of the City of Moline, Illinois, is white with "MOLINE" on the top, city seal in the middle, and "ILLINOIS/inc.1848" below. All letters in blue (?). It can be seen on Waymarking website: img.groundspeak.com/waymarking/f7e1ee2b-1410-47ed-ad1a-b1ffe2effe16.jpg. 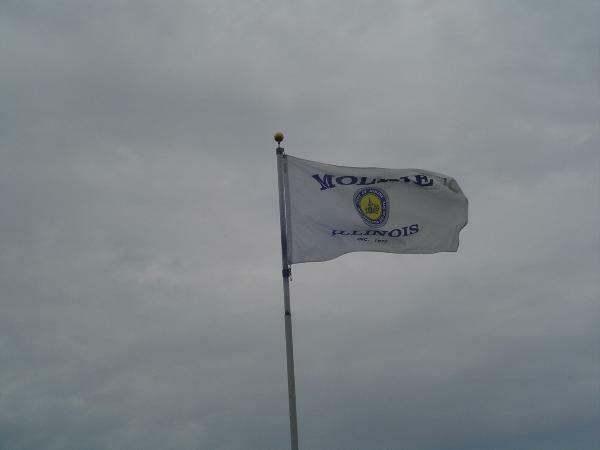 "Moline is a city located in Rock Island County, Illinois, United States, with an estimated population of 43,016 in 2007." - from Wikipedia: en.wikipedia.org/wiki/Moline,_Illinois.